sometimes, and what always amuses myself....is when I upload pics from my camera, only to be surprised by photos that I have no recollection of taking, but somehow hit the photo button...I like how my finger is actually in the shot of this one- the others were far worse, so that is why I'm only posting this one as an example. Oh my gosh! You have to click here to see the little video of baby, Ellie in the airport- it's a cute 8 seconds! Don't agree... If you weren't our celebrity, we all wouldnt be reading your blog. A celebrity that I want to celebrate. 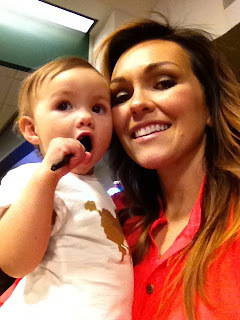 Like Walt Whitman said: "I celebrate myself and sing myself"
Kandee! I know you get random people everyday telling you how awesome you are, so just to add to that number I want to let you know how truly inspiring you are to me. When you post a new video, it literally makes my day and I think your one of the nicest, most classy, funnest people I know. You have helped me so much in my beauty journey, and I value your opinion a lot! I love the bag you designed (I'm trying to get my mom to buy it for me:)), I have bought many products you've recommend, so I guess what I'm trying to say is thanks. I have been wanting to let you know what an icon you are to me for a long time and I kept putting it off thinking you'd just see it as words on a screen, but I finally decided why not. So here is a real breathing teenage girl :)letting you know you mean a lot to me.